When Marie Cavanagh, care manager for Home Instead Senior Care in Ruislip and Harrow heard that Take Your Dog to Work Day was fast approaching, she jumped at the chance to get involved. As a keen Poodle breeder, Marie was excited to introduce her adorable Poodle Annie to dog-loving client Mary Phillips. 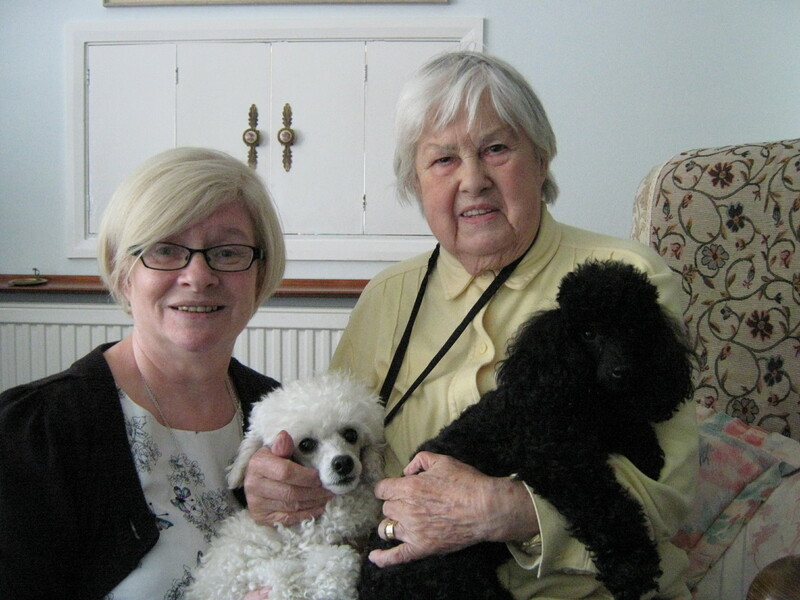 90 year old Mary Phillips from Eastcote owns a white Poodle named Edna and not only used to breed, groom and show poodles herself, but is also the patron of the British Toy Poodle Club and supports the Harefield Dog Trust. Over the past year she has been receiving care from Home Instead and was thrilled to hear that care manager Marie was keen to pay her a visit with Annie. For more information on Home Instead Senior Care in Ruislip and Harrow, or if you would like more information about becoming a caregiver, please call 0208 582 0250 or visit www.homeinstead.co.uk. Photo caption: Home Instead care manager Marie Cavanagh (left) brings her black Poodle Annie to meet client Mary Phillips (right) and her white Poodle Edna.